Develop Your Stones Meien Style -- Push into the Largest Part of the Board (王铭琬 の 铭琬流 石の動き「広い方から押し込む」 ISBN4-14-016113-2), by O Meien, NHK Igo Series (2002), 222 pages, based on an NHK lecture course running from April through September of 2001.
push (your opponent) from the widest direction. But this leaves a lot to explain: which part of the board is widest, for this purpose, and what kind of moves count as pushing? O Meien has specific lessons to teach about both of these questions. Progressing from simple positions early in the fuseki to complex positions late in the middle game, he refines what he means by "wide" and shows how to cope with an opponent who may be eying the same portion of the board. In each position, he discusses whether to try to destroy enemy stones, crowd them out, or seal them in, while we resist enemy attempts to do the same to us. "Destroying" is rarely the operation of choice since, in the relevant examples, only parts of the opponents' offending stones get destroyed; and the survivors accumulate enough thickness and other aji to make continuing trouble. 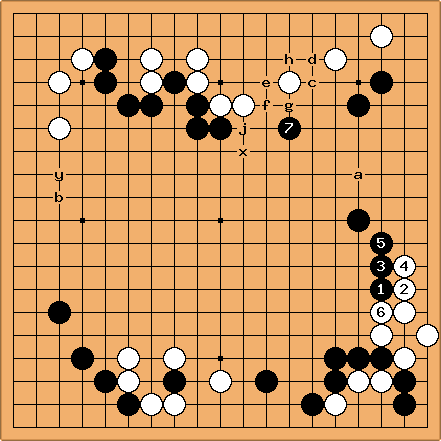 As O says, Go is a game of making territory, and to make territory sometimes you have to push the opponent away. (Thanks to JohnF for spotting this last statement. See the discussion.) And naturally, we want to push from a wider direction, confining the opponent in a smaller region. This last point may sound self-evident, but in a fluid position it may not be clear which direction will later turn out to have been the widest. So sometimes extra moves are necessary to resolve that question first. O Meien's principle naturally governs larger units of play than individual moves -- trying to optimize every move individually would be a "suffocating" task and probably impossible. As O says, "I myself would like to know how that could be done." He states, several times, that one of the corollaries of his principle --"play to create wide directions"-- becomes particularly useful on occasions when the action is at a temporary pause, or whenever a choice of next move is otherwise just too perplexing. He does not present many heuristic rules of thumb. Rather, he proceeds inductively, through the analysis of individual examples. He includes mistake diagrams so that we can see what the correct sequences are working to prevent. Chapter One is entitled Recognizing Largeness. It begins with the familiar early fuseki criterion based on the width of an open area coupled with the height of the bordering stones; but almost immediately we see that this mechanical count is only part of the story. "Largeness" is affected by the presence of vulnerable enemy stones (or our own), and we must also take account of the potential for large follow-up plays. We are shown that moves in a large region should sometimes be preceded by a sequence of preparatory forcing moves to secure mutual moyo points and make the large region larger, and otherwise enhance the value of the coming moves to us and diminish the value of potential responses from the opponent. We are taught to anticipate when a not yet visible large region will be coming into existence, some moves hence. We are told repeatedly that the real object, to which these principles are subordinate, is to point to moves which seize the initiative and enlarge our spheres of influence. Chapter Two is entitled Pushing and Immobilizing. (See the discussion for some clarification of these terms.) Here the examples concern coping with not yet live enemy groups inside the large area, whether by chasing them or by sealing them in and thereby creating an external large area. One thing we learn is that, sometimes, a collection of small regions containing stones of both colors may be fruitfully viewed as one large region defined by friendly stones, which happens to contain enemy stones that have leaked in and might be gaining footholds. Chapters Three and Four present an assortment of examples with many variations on the main theme, too varied to summarize. Chapter Five is entitled Fighting Made Easy. Here he means the kind of fighting that occurs while the two sides are contesting possession of large areas. Plenty of fighting is examined in earlier chapters but here he focuses on two particular kinds: first, the kind that occurs when two sizable but weak groups are adjacent to one another, each potentially threatening the life of the other and both too big to sacrifice. Second, and for the bulk of the chapter, he considers the kind which occurs when two large areas under the control of the opposing players are facing one another, with open mutual boundary, and each side is trying to break into the other. In at least one respect this is a difficult book: The author does not formulate any pithy, concrete rules that would conjure up immediate mental pictures. (Contrast this, for example, with Sonoda's "playing near live groups is small" or "enclosing territory makes it smaller".) It is up to the reader to make his own formulations, and in fact I found this hard to do, outside of the context of specific examples. This is why my chapter summaries dwell mainly on the topics covered rather than the advice offered. Nonetheless, this book presents the considered views of a distinguished master of the game. Even though most of the positions analyzed are taken from O Meien's own professional games, which might seem intimidating, he assures us that he has selected positions which stand out in his memory for the clarity of what was at issue, and which are especially suitable as instructional material for amateurs. The reader may find encouragement (or discouragement) in the fact that O Meien himself misplayed a number of these positions in the heat of the actual games. Yet, they serve as relatively straightforward examples of the principles he wants to teach, provided one can look at them in a detached way, not swept along by the momentum of earlier intentions no longer consistent with the position as it has developed. The book is written with a light touch. For instance, we occasionally get the opinions of an imaginary(?) 3 kyu and 6 dan who seem to be hanging around. Typically the 6 dan proposes a tactically sharp move in the wrong part of the board. The 3 kyu, on the other hand, proposes quieter moves which happen to be the ones O Meien was looking for. When O Meien asks him how he chose his move, his answer usually begins, in the best smug schoolboy style, "Well, as Sensei explained to us earlier.... ". Probably, the 6 dan wants to kick him! Also, the 6 dan does a lot of "smiling ruefully" after his mistakes are pointed out. 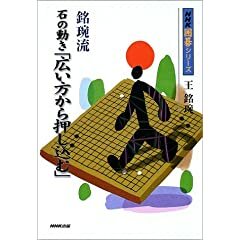 This book should appeal to players ranging from 3 kyu to 6 dan. Here are a few of the positions analyzed, with condensed incomplete summaries of some of the analysis. (Also: see BQM398.) Some very interesting positions have analyses too elaborate and multiphased to include here. 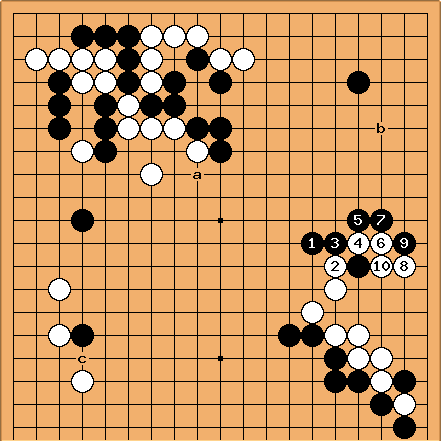 This early fuseki position appears early in the book. Black to play. O Meien has already discussed the fuseki principle of playing into the widest open side. In this case that would seem to be the right side, which is 9 lines wide, from r to r inclusive. However, here that criterion is trumped by the presence of the two marked stones on the bottom, which are unstable. B must play at b, making a base in what might have become W's sphere of influence, thereby isolating the marked W stone inside his own sphere of influence. If B were to tenuki and allow a W play at a, then W would achieve an extension from the two white stones on the lower right, combined with pincering B; so it would be B now caught in W's enlarged sphere of influence. In short, whoever gets to play first on the bottom seizes the initiative, which is the real point. O Meien explains a little further: If B plays first on the bottom his width there will be 9 lines, from x to x inclusive; while if W plays first not only will B not get those 9 lines, but W will have an 8 line width, from y to y inclusive, for a total spread difference of 17 lines. This outweighs the size of the right side. However, this calculation is only a secondary argument: the possibility of seizing the initiative is what really makes a play on the bottom so big. White to play; an apparently quiet position. Attempting to run with the marked stone is out of the question since if, say, Wh, then after leaning on the left with Ba, B will cap at j; and after W responds, say, by jumping one to the right, B will play at f. Thus B will seize the initiative by chasing W through dame while building outer strength, with increasing threats on the two stones on the right. So, says O, think width. Wc looks like the largest "big point" on the widest open side of the board, but playing here right away is no good either: B will respond by jumping straight out at a and k and eventually coming back to f, thus greatly enlarging his own sphere of influence and swallowing on a large scale. W will be responding on the left and making territory there, but B will have done much better. Actually, the left side of the board is the proper focus of attention, but in this way: W must first seize the initiative by playing at a, the mutual expansion point, simultaneously capping B and virtually forcing Bb. Now Wc is effective, as B's own possibility of enlargement has been forestalled and the left side is even larger than before. Next, Bd, We, Bf and Wg are one possible continuation. B's mistake lies in pushing from a strong configuration in the lower region towards a weak group at the top. 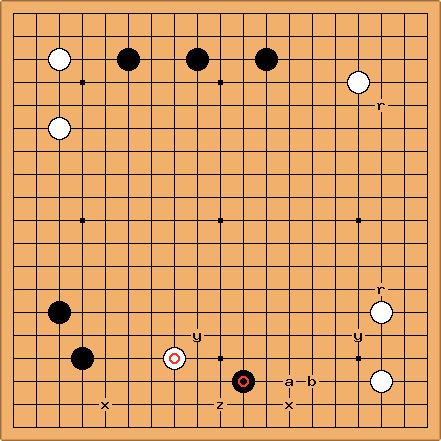 Actually, W's corner invasion has recklessly endangered the four W stones by leaving them stranded inside a strong B configuration, but B's response must use his upper stones from the start. According to O, B's strongest possible attack starts with , which enlists both the lower and upper B stones in a plan to seal W in completely. Play could continue as shown, ending with Wa after . O urges the reader to pause and savor this outcome! Play might continue further with Bb, Wc and Bd, with the sente move Be still possible later. Actually, according to O, the preceding plan requires great reading skill to carry out -- W has quite a bit of counterplay, not shown, and although B should prevail in the end, the variations become difficult. So an alternate, simpler plan is to start with at , closer to the upper B stones. Two variations are supplied showing that W might get a somewhat enlarged group, or even that it could slip out into the center btween the newly placed and the lower group. In the latter case, though, B still encloses plenty of territory or sphere of influence both below and above the W center piece. At any rate, the variations become simpler, and in both cases the outcome is good enough. Black to move. The local 6 dan proposes Ba, in the widest open side, with a threatened follow-up at b. But W can ignore Ba and play the severe Wc, seizing the initiative, so Ba can't be right. 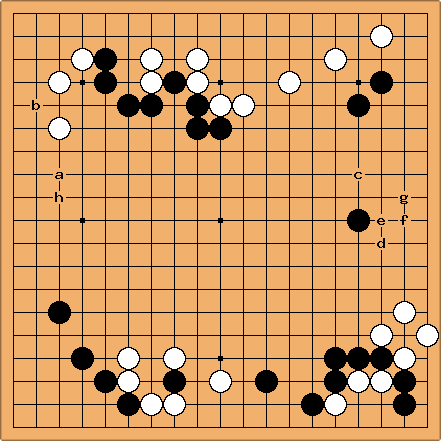 Even so, starting with ultra-solid Bc instead isn't right either, because after Wd, Be, Wf and Bg, W can tenuki to h. B still falls behind because his initial Bc puts no pressure on W.
To strengthen the vulnerable right side while simultaneously putting pressure on W, the 3 kyu "modestly" proposes pressing with which, of course, is just what O Meien wanted. After the sequence to , though, the critical task for B is not to play a passive defense at a, but instead to make a new press at : W's thin upper side has actually been the ultimate target all along, and an underlying motivation for strengthening B's right side was to enhance the largeness of the right center, the direction from which B now pushes. So instead of starting at b, W turns at j to get access to the center, and naturally B blocks at x. The result is a ferocious cut and slash battle for another twenty-five moves, way too long to present here. But at the end, W's main group is sealed in anyhow while an eyeless W component is cut off in the central region and under severe attack, to B's great profit from every attacking direction. And when the attack finally peters out, B takes sente to play at y anyhow. The action is at a pause; Black to move. W's lower right group is unsettled, and B has an absolute sente move at a: if W doesn't respond to Ba, then B catches his stones in the crane's nest tesuji. But playing at a right away would be premature. This being so, a B move at, say, b, is anti-thematic: W would push along the fifth line, at 2 and 3, and if, say, B responds at 4 and 5, then W could switch to c. B will have gotten some territory along the right side, but also W's outer influence will have negated any thickness B could develop by playing at a. At this point the 6 dan proposes the move , with the resulting sequence sealing W from pushing into the upper right. While O Meien allows that this is the right direction of play, the move isn't good enough: the result is not squeezing the utmost advantage out of the anticipated Ba. 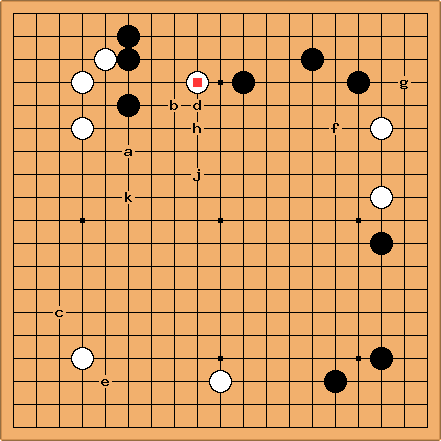 The 3 kyu proposes the simple push at , resulting in a wider upper right region for B, up through ; this meets O's approval. Then the crane's nest threat is played out, followed by Ba, Wb, and Bc. One might wonder whether the upper right can be successfully invaded by W, before it gets too secure. A variation is shown in which, instead of responding to with , W plays at d and then turns around and invades at a. But W's lower group isn't strong enough to back this up: because it is so wide open it barely survives the ensuing fight, while W's invading group remains precarious. Meanwhile B gets territory both on the top and along the bottom. Bill: Please explain this more. I agree about the move, but if Black does not play the 2 space extension, allowing White to extend on the bottom, why does he not still have a total width of 6 lines. And why, if Black does extend, doesn't White still have a total width of 8 lines? It is not like either play cuts a sector line. FredK I agree there could be more to say, but O Meien doesn't say it. The numbers come straight out of his text -- he speaks only of a "sketchy numerical value", without explaining why precisely those numbers are the only meaningful ones to compare. I imagine that if B gets to extend, then W's three stones on the bottom do not deserve to be called a sphere of influence; so in O Meien's view, perhaps, the 8 line residual width does not then deserve to be counted. A similar statement could be made if W gets the first move. But this part of his discussion seems to be an almost half-hearted addendum for people who aren't already convinced by his initial, non-numerical analysis. I suspect that the possible ambiguity arises because O Meien never actually explains what he means by "sphere of influence" (or, for that matter, "seizing the initiative"); maybe he doesn't care about these sector lines in this position, for reasons that would be instructive to learn.